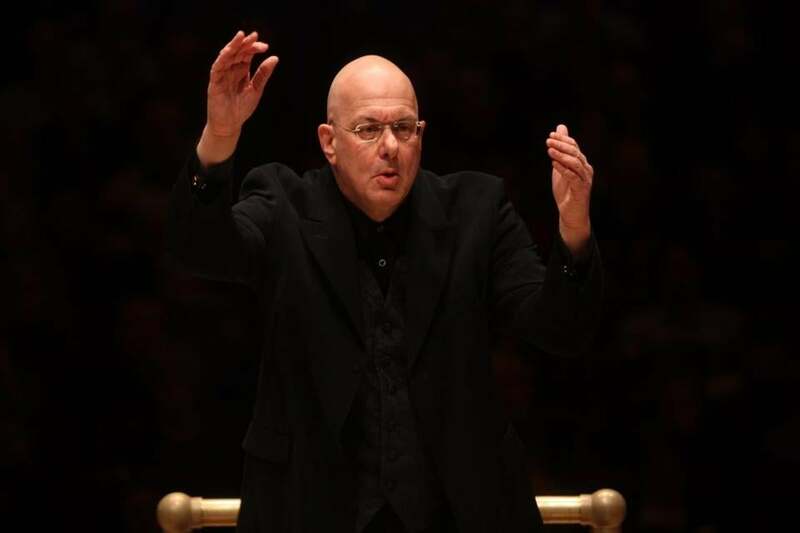 Leon Botstein is pictured leading the American Symphony Orchestra earlier this year. NEW YORK — Every summer, any New Yorker with an ounce of cultural curiosity heads up the Hudson River to Bard College and its annual festival. This is the leafy domain of the unusual Leon Botstein, who is not only Bard’s president but music chief of the American Symphony Orchestra. That Bard comes with a Frank Gehry-designed theater only adds to the luster of the place. You’d have to go to Europe for a comparable mix of smart talk, theater, cabaret, music, and rarely produced operas. Bard SummerScape runs through Aug. 19 at Annandale-on-Hudson, N.Y.
Botstein spoke before heading off to rehearse the first professional US staging of Emmanuel Chabrier’s ‘‘Le Roi Malgré Lui’’ (“The King in Spite of Himself”). A. He’s the greatest French composer between Berlioz and Debussy. He was a Wagnerian, but this is a farce based on a true story about Henry de Valois, who became Henry III in France, and briefly was elected king of Poland. A. When the inherited kingships died out at the end of the 16th century, the Polish noble parliament, incredibly, decided to elect kings. He served for six months before his brother died and he inherited the French throne. The opera, written in the 1880s, is a spoof on European unity, which is one reason we chose it. Q. And we are so glad. The regular opera repertoire is mind-numbing. A. It’s horrific that the same repertoire is done over and over again. No repertoire can stand that amount of exposure. No book, no picture can be read that often and still excite you, no matter if you put naked people all over it. Q. Beyond opera, the sameness of the concert repertoire is dispiriting. A. The symphonies of Beetho­ven, Mahler were never designed to be repeated as often as they are. They’re fragile objects. They get banal when heard every day, to the great detriment of new music. A. Management and the training of musicians. If you’re a young violinist, you’re trained that you need to learn five concertos, because that’s all you’re going to be asked to play, when in fact there are 40 great concertos out there. With a few exceptions, the business is controlled by a class of people who are risk averse. They misread the audience so they’re scared, and think the audience is incapable of listening to something that they don’t already know. Yet we don’t go every year to see ‘‘Casablanca.’’ We actually like to see new movies or plays. Q. How do you evaluate the Met telecasts? A. They are neither bad nor good. They’re a new art form, which is a singing movie with subtitles. It has two negative consequences. It’s not opera anymore, and when I go to the opera house, the set is designed for the camera, not for me. Q. You spend a great deal of time as an educator. Just now the issue of online education roiled the University of Virginia. A. This is a totally misguided idea — really good teaching requires close range in small groups. And inefficiency needs to be seen as a good thing — people sitting around thinking and looking like they’re doing nothing. One out of 100 is going to actually solve the important scientific issues that will lead us one step closer to solving cancer. Q. The other topic is student debt. A. University tuition in a private institution is a complete bargain. Consider: You get 30 weeks a year, three meals a day, a roof over your head, all the entertainment you could want, and all the instruction you could want. You get a ready-made community for, say, $50,000 a year. You check into any motel, eat three meals a day, buy entertainment of that quality, and it will cost far more. No one in the university is making a fortune; no one at the university is getting rich. Is it more efficient and more trustworthy than any American corporation? The answer is yes. So stop hammering it. It’s not the problem. A. The problem is the country does not have a rational system of financing people to go to college. You’re not going to solve the problem on the expense side. You’re going to solve it on the financing side. There’s no shortcut to a good education and a good university. Q. What might be a better way? A. There should be a graduated scale — Bill Gates’s child should pay $120,000 a year, a poor child should pay nothing, and loans should be repaid at rates contingent probably on one’s career. So if one, for example, becomes a teacher, I would argue that the loan should be forgiven. Q. So that brings us to topic number three: college sports. A. It’s scandalous that the American university has become prisoner to being a farm team for professional sports. That the coach gets paid more at the University of Miami than the professor of neurobiology is scandalous. That is the pact with the devil that American universities had to make to avoid populist, know-nothing rage. So they throw the sports bone to the public.